Firstly, a specialist contractor must place scaffolding around the property. Work can then commence on the replacement of the house’s eaves with new ‘bottles’ of straw. This forms the ‘eave course’ which must be securely fixed as the thatch will overhang the side wall and is thus, vulnerable to wind damage. The first ‘eave bunch’ is laid at 45 degrees and overhangs the wall by approx 12 inches. It is fixed securely to the first ‘batten’. 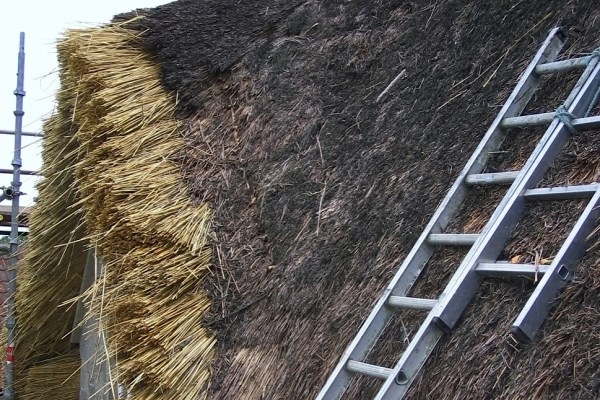 The replacement of the eaves is largely a cosmetic exercise that ensures the roof of a re-thatched property looks entirely new and there is no evidence of the old coat.